Comics for Choice is now available digitally for $0+, with all proceeds going directly to the National Network of Abortion Funds! This helps make the book available as an educational resource, while continuing to raise money for NNAF's important work. Please consider donating. 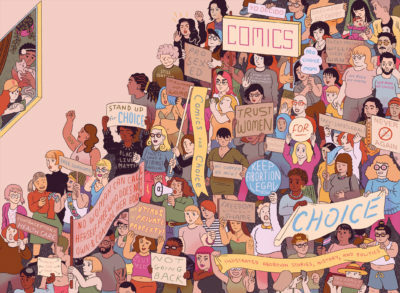 Comics for Choice is anthology of comics about abortion. Cartoonists and illustrators have teamed up with activists, historians, and reproductive justice experts to create comics about their diverse personal stories, the history of abortion, the current politics, and more. The anthology has been honored with the Ignatz Award for Outstanding Anthology, and nominated for an Eisner Award, for the short story "Small Mistakes Make Big Problems." Buy Comics for Choice online!